This week I explored more work done by Tattoo Artist William Trask owner of Premiere Tattoo, but more so dedication tattoos to the loved ones who are no longer with us today. My dear friend Vince Pellegrino committed suicide exactly one month today, but his memory lives on with us in our hearts and for some people in their artwork. 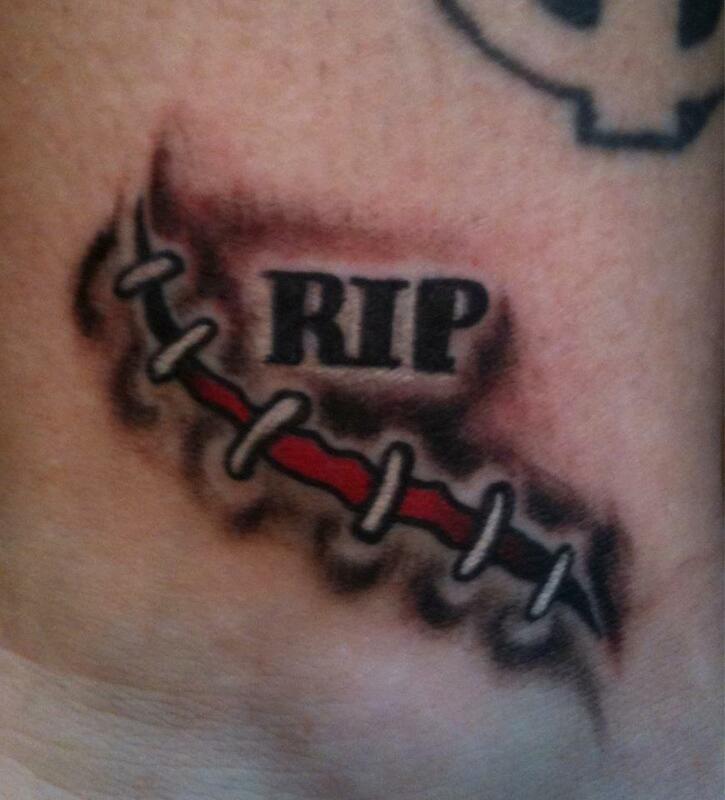 This dedication tattoo was done on Jennifer O’Neill Trask’s inner ankle in honor of Vince Pelligrino. There is an RIP over tattooed stitches because Stitch was Vinny’s nickname for a long time. A lot of people didn’t know his actual name because they were so used to hearing Stich instead of Vinny or Little Vinny. The photo is courtesy of William Trask’s Facebook page. 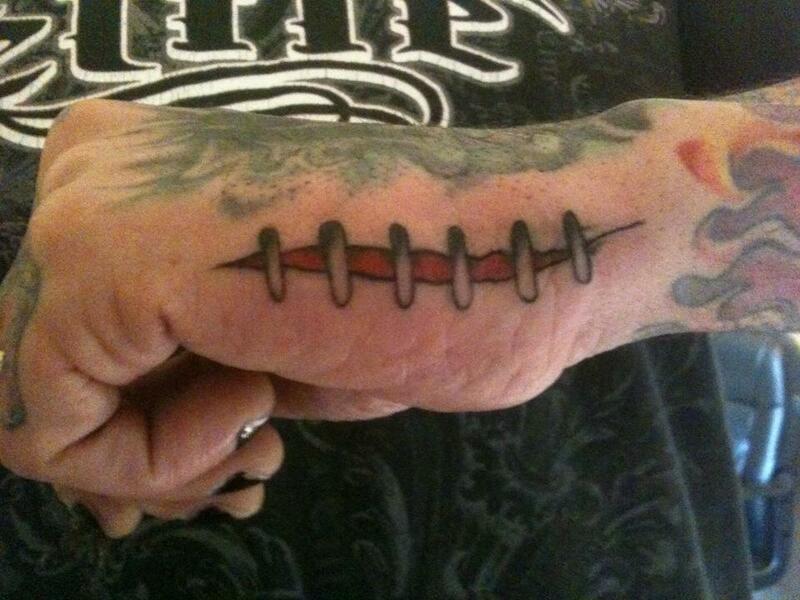 This tattoo of stitches was done on William Trask’s left hand in loving memory of Vinny. It is one thing to do dedication tattoos, but it is something else completely when you are tattooing dedication tattoos for a best friend that you lost. This photo was courtesy of William Trask’s Facebook page. This photo is of two dedication tattoos done on Steven Wallenburg‘s left leg. 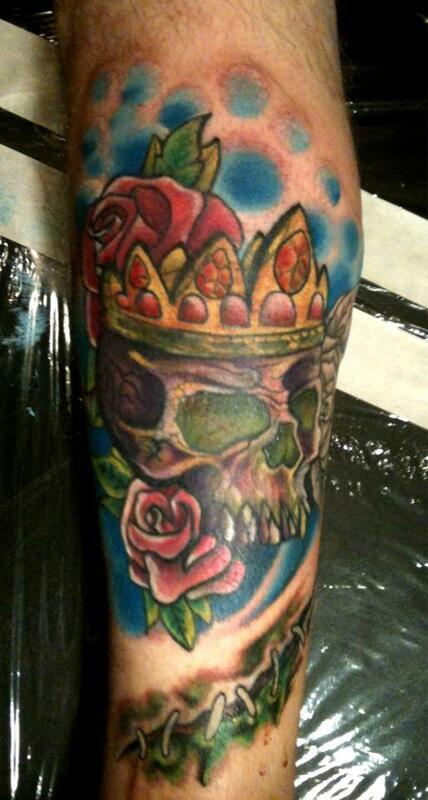 The tattoo with the skull in the crown above the rose was a dedication tattoo to our friend Gabe who was murdered in 2006 and who is missed very much. The tattoo below it is of stitches for Vinny with green blood instead of red because it was one of Vinny’s favorite colors. This photo was courtesy of Steven Wallenburg’s Facebook page. This entry was posted on December 3, 2011 by Brianna Foley. It was filed under Art, Dedication and was tagged with dedication, love, memory, rest in peace, tattoo.